Have you heard the latest Buzz about Julie's Bakeshop? It is none other than the JULIE'S BAKESHOP: Istoryaheee Promo! It is not everyday that you get to share your heartwarming story to other people. It may be the story about your first date with your crush at Julie's Bakeshop or how your boyfriend proposed to you while buying pan de sal at Julie's Bakeshop. One funny Julie's Bakeshop moment I had, was when I had just arrived in the Philippines from my vacation in China and I was wearing warmers, jackets, winter boots, yeah, yeah , yeah, the works, and everyone ( saleslady, baker, customers) at Julie's bakeshop in Cubao were staring at me, ha ha ha! They were wondering where the heck I came from, because I was in winter clothes and everyone around me was in shorts, slippers and sando. The temperature? 28 or 30 degrees Celsius. Ha ha ha! Funny but true. But they can't blame me, I miss eating pan de sal . I went to Julie's Bakeshop Cubao straight from the airport to have my pan de sal and coffee fix. Why keep to yourself your Julie's moment story? Everyone, grab this chance and turn your Julie's Bakeshop moments into CASH! Join and Win up to P 15,000 ! 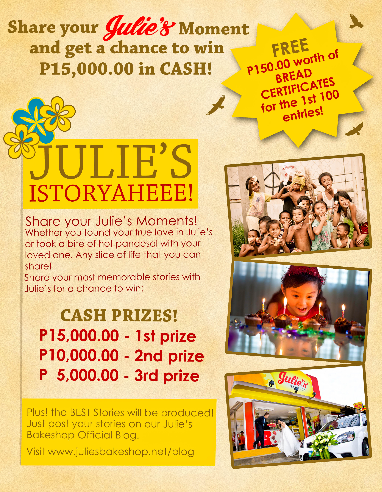 I bet, like every bread loving Pinoy, you don't want to miss the Julie's Istoryaheee contest which by the way will end on September 20, 2012 at 11:30 p.m. So what are you waiting for? Share your Julie's moments now for a chance to win Php 15,000! How? Just share your memorable moments you had with Julie’s Bakeshop. The Istoryaheee Promo Campaign is open to all legal residents of the Philippines, 18 years old or older. Write a story describing your memorable moments with Julie’s then log in to Facebook and Like Julie's Bakeshop on Facebook then fill up the comment form. Entry must be the original work of the contestant and should include a description about the moment or experience being represented. Contestants must post the title of their stories. Stories must be no more than 1,000 words. Please do not submit duplicate entries. Duplicate entries will be discarded but contestants are encouraged to submit multiple unique entries. Time and date of the posted stories will be traced and monitored. This will also be a First Post, First Acknowledge basis. If and there will be a tie, the three (3) Best stories will be given another one (1) day to break the tie. The best stories will be produced. Contestants must be willing to let Julie’s produce their stories. A waiver will be sent to whoever wins the contest. Contestants must have expressed consent of anyone featured in their entry. Contestants may only vote for their own entry or story once during the duration of the campaign. All selected contestants will be required to respond to the phone and/or e-mail notification within the time period specified in the notification. The failure to respond timely to the notification may result in forfeiture of the prizes. Upon selected contestants, Julie’s have the right to use winning submissions in merchandising, advertising, marketing or promotion or for any other commercial or non-commercial purpose without additional compensation to the contestants. Anyone can participate except for JFC Employees and all Julie’s Bakeshop staff. I am so excited of what will the results be of the ongoing Julie's Bakeshop Istoryaheee contest. Folks, please take note that the contest started last June 20, 2012 12:00 AM and will end on September 20, 2012 at 11:30 P.M.
Top 3 BEST stories will be given the following cash prizes. These winners will be selected by Julie’s. Bread Certificates worth Php 150.00 each will be given to the first 100 entries as the campaign begins. Looking forward reading your story my dear readers!